Merten was born in Akron, Ohio, but grew up in Los Angeles, California. He attended SMU, where he won individual national championships in the 100 and 200 breaststroke (the first in the history of SMU swimming) and set new American records in doing so. 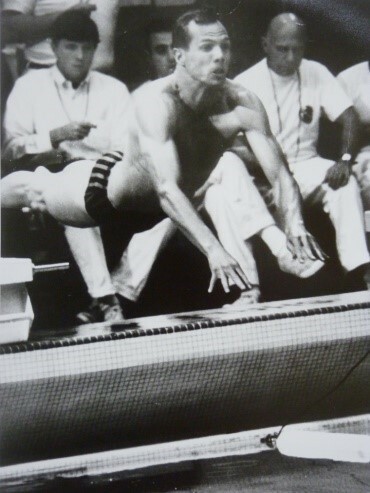 Merten won a silver medal in the 200 breastroke at the 1963 Pan American Games and followed that up four years later at the 1967 Pan American Games with a pair of bronze medals in the 100 and 200 breaststroke. At the 1967 World University Games, he won three gold medals in the 100 and 200 breaststroke and the 4x100 medley relay, which set a world record. In 1968 he represented the United States once again at the Olympic Games in Mexico City. He competed in the 200 breaststroke and was a semi-finalist in the 100 breaststroke. After finishing his swimming career, he coached a club team at Town North YMCA for six years as well as 18 years at St. Mark's School of Texas, where his swimmers earned many prep school all-American honors, as well as several Southwest Preparatory Conference team championships. Over the course of Merten's swimming career, he won 10 individual National AAU championships in the breaststroke. Merten is now retired after a 32-year career as a teacher, coach and school administrator at St. Mark's School of Texas and The Parish Episcopal School. He actively competes in windsurfing within his age group, winning one national championship, and was an active participant in Swim Across America, a non-profit organization that uses Olympic swimmers to raise funds for cancer research. He lives in Cary, North Carolina.